You feel Tales of the Cocktail from the beginning, whether it’s the heat and humidity clinging to your arms upon every exit from a comfortably conditioned space or the mishmashing of sweaty bodies crowded around the corner at Lafitte’s Old Absinthe House pre-dawn. The energy is palpable in the gilded lobby of the Hotel Monteleone each time you step in, heading to a session about drinking preferences in cities around the world or the history of your favorite spirit. A hug awaits in every direction, greeting those you haven’t seen since last year’s gathering in the Big Easy. 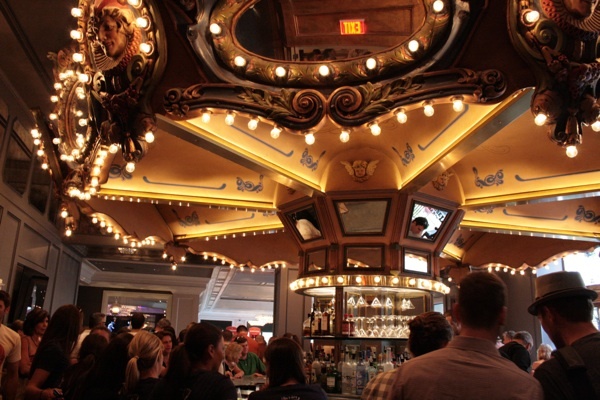 The Carousel Bar spins you slowly around the center, allowing you to watch the scores of friendly faces meet and welcome, cheer and sip. A pat on the shoulder comes your way from greats like Tony Abou-Ganim, Steve Olson, Dale DeGroff, Ron Cooper as they drift through the sea of people. And what about the food and drink? That first session of the morning, the plastic Tales cup hitting your lips during a distilling panel, its 90 proof straight shot coursing across your tongue before it burns down your throat. The tickle of the garnish against your nose as you pause at the Bloody Mary bar on the mezzanine or the ballrooms full of new products and people. On your brief outings for proper meals, you find the soft dusting of powdered sugar between your fingers, beignets settling comfortably in your stomach, or the hot-from-the-fryer fried chicken from the dive bar down the street. It’s all there in a whirl and blur of goodness, scattered with laughter and a little business.